BY ROBERT ROSS : Investing is all about making the right choices. And one of them is owning dividend stocks. 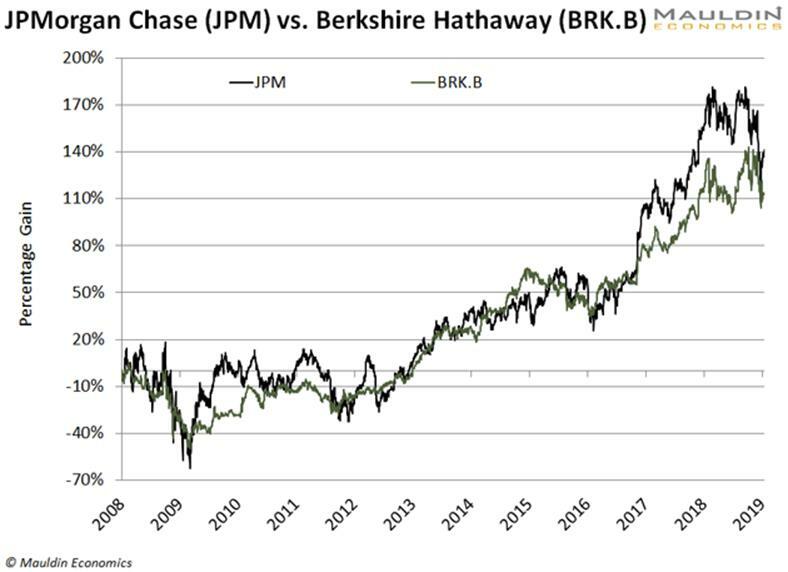 Let’s look at two companies as examples: Berkshire Hathaway (BRK.B) and JPMorgan Chase (JPM). JPMorgan Chase gained 141%. Berkshire Hathaway shot up 113%. That’s a pretty big difference—but wait until we factor in dividends. With dividends, JPMorgan Chase crushed Berkshire Hathaway big time. Since the start of 2008, JPMorgan Chase has regularly paid a dividend. The company’s average dividend yield during this period was 2.8%. That’s not a huge dividend. It roughly matched the average S&P 500 dividend yield. A modest dividend might not seem like much. But look what happens when it adds up over time. On January 2, 2008, JPMorgan Chase stock was $42.17. Since then, the company has paid $16.46 in dividends. If you had bought shares on that date, you would have earned a 39% return in just dividends. That boosts JPMorgan Chase’s total return to 180%. Berkshire Hathaway shareholders who didn’t get paid any dividends are left with the same 113%. That’s a huge difference. And it’s only over a 10-year period. Over the past 20 years, JPMorgan Chase has rewarded investors with an 85% return—from dividends alone! But there’s also another reason you must own dividend stocks today. It’s rising interest rates. When interest rates are low, it’s cheaper for a company to borrow money. When rates climb higher, the opposite happens. It costs more for a company to run and grow its business. That can lower a company’s earnings and drag down its share price. But this isn’t true for all stocks. A study by ETF provider Global X Funds found that between 1960 and 2017, stocks that performed best in a rising rate climate were high dividend-paying stocks. How high? Stocks that paid 6.4% or better in dividends beat the S&P 500. But here’s the catch. You must own the right kind of dividend-paying stocks. Be especially careful with stocks paying big dividends. When rates rise, stocks with high dividends beat the S&P 500 seven out of 10 times. But you don’t want to buy just any stock with a big dividend. Many struggling companies pay fat dividends as a way to lure investors. Worse, some companies go as far as borrowing money to pay their dividend. That’s a recipe for disaster. Even companies with timeless brands aren’t immune from dividend cuts. 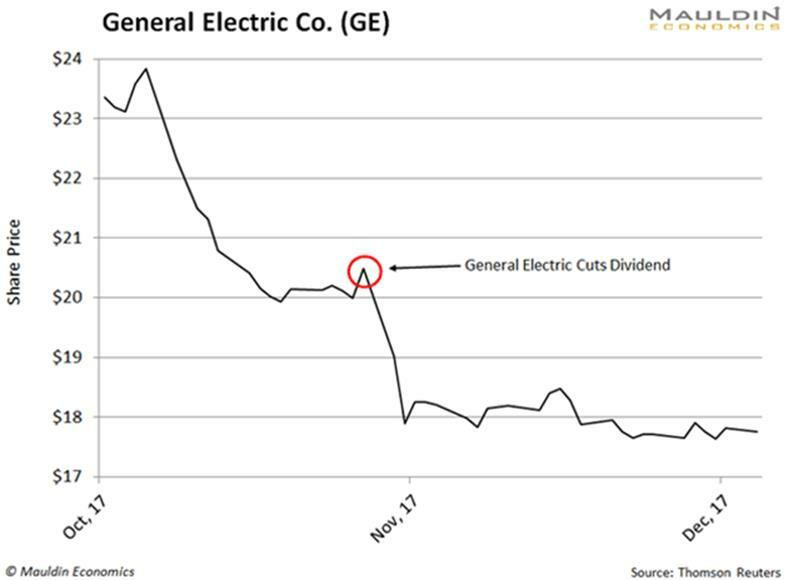 GE shares plunged over 10% on the news. One year and a second dividend cut later, shares have been smashed 57%. That’s why I developed a tool that helps gauge the safety of a company’s dividend. I call it the Dividend Sustainability Index (DSI). Dividend Sustainability Index (DSI) looks at three key things when evaluating dividends. The most important is the payout ratio. It is the percentage of net income a firm pays to its shareholders as dividends. The lower the payout ratio, the safer the dividend payment. The second is the debt-to-equity ratio. The more debt a company has, the harder it gets to run a business. This includes—you guessed it—paying the dividend. The third is free cash flow. It is the amount of cash left over after a company pays its expenses. If any of these measures is flashing red, the dividend is in trouble. Avoid these stocks by any means.